by Bill Dwight on Tuesday, May 23, 2017 at 10:07 PM | LEAVE A COMMENT! I opened up iTunes today to perform my periodic check on FamZoo reviews. My mind was blown by “ReggaeGeek” — a dad with two kids 12 and 14. He left the most epic review ever. So epic in fact, that I couldn’t include the whole thing on our kind words page without crowding out the others. So, I’m sharing the full review text here. Sure, it’s highly complimentary, so you could dismiss this post as a shameless self-promotion. But ReggaeGeek’s review is also comprehensive, instructive, real, and — for us — insanely motivating. 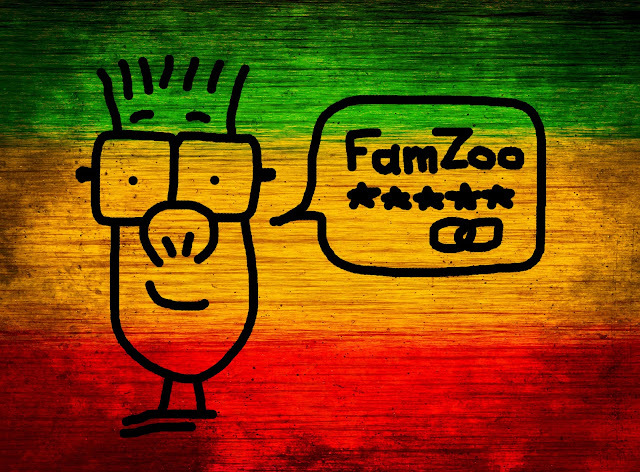 ReggaeGeek’s personal FamZoo story describes precisely the positive outcome we’re striving to facilitate. Reading it motivates us to double down and work harder to replicate his experience in more and more families. And, no, I have no idea who ReggaeGeek is. That’s what makes his story particularly gratifying. So, if you want to see how some “regular parents” used FamZoo to transform their kids’ money behaviors in ways that were nothing short of “incredible” (ReggaeGeek’s words, not mine), read on. There are some priceless tips in here that you may want to adopt in your own household. We decided to wait until we had used the service for a full year before writing a review. I renewed our subscription for 2 more years today. I can’t even imagine going without FamZoo anymore. Both of our kids (age 12 & 14 now) LOVE their FamZoo accounts. Their friends almost always end up telling their parents that they want FamZoo too. Allowance flow based on both expected chores as well as optional “extra chores” that they can choose to do for extra money. They have a spending account, a charitable giving account, and a savings account. Their allowance is split to give a certain % to spending, charity, and savings automatically. We also give a matching % to their Savings Account to give extra incentive for saving. This is also set up to be automatic. I love how all of that can be fully automated by the way we configure the accounts. They may use the spending account at their own discretion. We don’t put any restrictions on the use of that money. They may also take out a loan from their savings account up to 50% of its balance. It automatically charges them interest on their “loan” and we limit the number of weeks they can take to pay it back. This is the account into which we deposit money for a specific purpose, like when it’s time to buy school clothes. We put a specific amount in and the transaction is noted with what it’s for. They can spend that amount with their own discretion but it must be on the intended purpose, like School Clothes or some other event. We then spend an additional amount (that we choose) to buy them the items we know they will need for that purpose, and they can spend their allocation the way they want to without asking. The transformations in their money matters over the last year have been incredible. No more asking for money for everything they want at the moment. No more “can I get this” every time we go in any store. No more wondering how much we actually gave them in a month, and on, and on, and on. They have learned how to purchase their own items and pay for them with their cards and use their PINs with the cards. They now understand sales tax. We can drop in money in instantly if an emergency situation happens while they are away from home. We can drop in a reward transaction for academic performance if we feel like it. We can also “ding” them monetarily if something that we expect to be done does not get done. Since my wife and I also budget the discretionary money we each get a month, we have also moved our “allowances” to our FamZoo cards. I cannot understand why every parent does not have this service. We have had probably 5 of our friends put their families on it already, or they are getting ready to. It also forces us to be good at allocating the budget each month so that the money that needs to go into the FamZoo “money flow” is there each month which helps us control our budget. The customer service when we needed help has been above and beyond great! It’s so nice to have someone that you can understand and who also understands everything you say. They have helped us on everything from simply explaining how to set up something we wanted to do, to figuring out why Amazon was having an issue using the FamZoo cards on my 1-click purchase option. EVERY issue we have ever had has been resolved quickly and professionally. Usually we get a follow up email from the owner of FamZoo to make sure everything was resolved. Hard to believe these days, but nice! The ONLY complaint we have heard is that our older child and some of the older children of our friends that have joined (especially the teen boys) don’t think the “FamZoo” logo is cool. They would like the option to choose some other designs for their cards. This is minor and they have solved it with stickers of things they like. OK, that’s my review for the first year. It’s a completely honest review from just us regular parents. I am sure someone else may find a few other nit pick items that could improve, but almost everything about it for us has been positive. I would not want to ever have to go back to passing out cash to our kids...ever. Can you believe all of that thoughtful detail fit into one iTunes review? Now you know why I was blown away. All I can say, ReggaeGeek, is I’m diggin’ your family’s tune. Thank you. The results are music to our ears.